As a Methodist since childhood, I have embraced the Wesley concept of taking Christ’s message of unconditional love to all people everywhere. This led me into missionary service in my younger years, and in 1994 I found another opportunity – helping to establish the Church of the Reconciler. I joined the Reconciler at the Charter Service on Sunday, May 26, 1996 and signed on as an affiliate member – or so I thought. Since that time, I have faithfully given my heart, effort and financial support to Reconciler. It represents to me the place where Christian love is radically enacted and lives are changed. I have worked to support all programs including Vacation Bible School, United Methodist Women and as financial secretary in the very early days! I suggested, and for several years chaired, the Silent Auction which takes place at our annual Banquet fund-raiser. I have served in various capacities, most recently as chair of the Staff/Parish Relations Committee, which is no more. 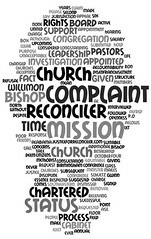 All previous committees and their leaders have been dismissed since we no longer have status as a fully chartered United Methodist Church. 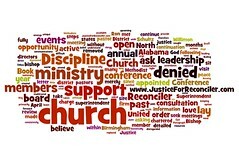 Devastating action was taken by the District Superintendent and the North Alabama Conference in early 2011. Our fully chartered church had taken a “mission” designation in 2005 to meet equitable salary requirements, but we were never told that doing so could involve a complete take-over. In fact, the church was doing so well that we expected to be able to quit mission status in a few years. The Conference did not interfere during our other “mission” years. We knew nothing about charges against our ministers until the SPRC was called into the DS’s office on April 6, 2011. It was a surreal moment. How can this happen? Where did this come from? It only got worse from there. We were admonished not to talk about this to anyone under threat of our pastors’ credentials being taken from them! We were given no briefings on the status of the investigation. After three months, we learned that our ministers had been cleared, but they were not coming back. Lawton, Sr. whose prophetic vision founded the church was prevented from ever setting foot on the property! A leadership vacuum developed and the church floundered. Such dismissive, heavy-handed treatment is not fair or just, let alone Christian! Ironically, a great injustice has been done to a church which stands against injustice of all sorts. Because Reconciler has always had a large homeless component, steady leadership is hard to find. Thus, many of the church functions were taken on by affiliate/associate and non-members who worked faithfully over the years. We are now told that those affiliate/associate members (like myself) are not members of the Reconciler and therefore cannot hold any office or have a vote in the church. This takes away many of the traditional, dedicated, long-term leaders. There has been no regard for any historical vision or the reason and value of any tradition. The past 18 years are just wiped out. Instead, the church will be overseen by an Advisory Board to be appointed by the DS and the current pastors, excluding all of us who have signed letters of complaint against the DS and the Bishop. We were told that other churches have lost beloved pastors and learned to just move on. However, their entire leadership and history was not wiped out! We have protested every way possible but they insist that the Conference has the power to take us over. If so, the way it has been handled is a disgraceful insult. Such bully tactics are unbecoming to any Christian group. A big question is WHY NOW? I am reluctant to suggest something and I sincerely hope I am wrong, but I am not alone in my conclusion. It seems to be a win-win situation for the North Alabama Conference and the Birmingham business community (which has wanted the homeless off the streets of Birmingham since the church began). If our church no longer exists, the Conference can sell the now valuable property on 14th Street North which has escalated in value to $2-3 million due to development of Railroad Park, the ball field, etc. If we had been asked, the banished leadership would have gladly moved to another run-down part of downtown with promise of a fair share of the proceeds to get set up and pay our bills. I so very much hope I am totally wrong about this suggestion. I don’t want to believe that “my” Methodist church would have such unfair and unjust motives. God help and bless us all!